Poll: Who Are The Best Centers In The NHL? The NHL Network lit up the hockey world recently when they revealed their list of the Top 20 Centers in the league, ranking Connor McDavid as the best in the league ahead of Sidney Crosby and Evgeni Malkin. The number four slot was occupied by Auston Matthews, which ruffled some feathers, while the reigning Stanley Cup champions Evgeny Kuznetsov and Nicklas Backstrom were down at 13 and 14 respectively. The Penguins (Croby, Malkin), Maple Leafs (Matthews, John Tavares), Capitals (Kuznetsov, Backstrom) and Oilers (McDavid, Draisaitl) all had two names on the list, while other potential options like Eric Staal, Vincent Trocheck, Jonathan Toews, Brayden Schenn, Brayden Point, Ryan O’Reilly, Sean Monahan and Dylan Larkin were all absent. Since the NHL Network’s fan vote was so different—Jay Beagle ranked 20th on the list—we thought we’d do our own tally here at PHR. In the poll below we’ve listed many options and are asking you to vote for your top group by selecting 10 names. Does Matthews stay in the top five? Can defensive wizards like Anze Kopitar and Patrice Bergeron climb up the rankings? Does the PHR community believe in William Karlsson? Cast your vote for the top 10 centers in the league and make sure to leave a comment explaining your choices. *Though Claude Giroux has played center for much of his career, his absence from the NHL Network list means he was likely left off the ballot. We’ve similarly left him out of the poll, along with other part-time centers like Joe Pavelski, Blake Wheeler and Logan Couture. If you feel as though any of them should be included in this group, make sure to leave a comment down below. The St. Louis Blues have done everything they can to retool their team to not only get them back into the playoffs, but make a deep run of it. They went out and acquired Ryan O’Reilly, signed Tyler Bozak, David Perron and Patrick Maroon and have two top prospects on the brink of joining their team in Robert Thomas and Jordan Kyrou. However while answering mailbag questions, The Athletic’s Jeremy Rutherford (subscription required) suggests that the biggest improvement to the team should come from within as he believes that Vladimir Tarasenko has just scratched the surface of what he’s capable of. The 26-year-old has posted goal totals of 37, 40, 39 and 33 goals over the past four seasons, but he is more than capable of becoming the superstar that many felt he could be when he was drafted in the first round in 2010. Rutherford even compared him to Brett Hull. However, the scribe says he needs to fix a few things if he wants to take that next step, including playing more relaxed and not let everything around him frustrate him. He also feels that although he’s coming off shoulder surgery this offseason, he needs to get into the best shape of his life and be more engaged on the ice. For a rare change of pace, the Chicago Blackhawks prospect camp was dominated by the team’s defensive prospects, which included several big names including 2018 first-round pick Adam Boqvist. The Athletic’s Scott Powers (subscription required), who posts his 20 takeaways from development camp, writes the most important fact is that of all their blueline talent, four of those players have the potential to develop into top-four talent, including Boqvist, 2017 first-rounder Henri Jokiharju. 2018 first-rounder Nicolas Beaudin and 2017 second-rounder Ian Mitchell. That’s a big improvement for a club that hasn’t produced a top-four defenseman since they drafted Niklas Hjalmarsson back in 2005. The team has had multiple failures when drafting defenseman in the first two rounds since then or have traded them in deals to improve their NHL club instead, including Simon Danis-Pepin (2nd-2006), Akim Aliu (2nd-2007), Dylan Olsen (1st-2009), Justin Holl (2nd-2010), Stephen Johns (2nd-2010), Adam Clendening (2nd-2011), Dillon Fournier (2nd-2012) and Carl Dahlstrom (2nd-2013). In a mailbag series, the St. Louis Post-Dispatch’s Jeff Gordon writes that top prospect Jordan Kyrou, who has finished up his junior career, will have a tough time earning a spot in the St. Louis Blues’ rotation next season after the team went out and acquired David Perron, Tyler Bozak, Patrick Maroon as well as the potential return of Robby Fabbri from injury. With the exception of an amazing training camp, Kyrou is likely to start the season with the team’s AHL affiliate. Kyrou, who posted 39 goals and 109 points with the OHL’s Sarnia Sting last season, should be ready contribute soon as injuries at some point will likely allow the team to give Kyrou some time with the NHL club. Free agency is now a little more than a month away from opening up and there are quite a few prominent players set to hit the open market while many teams have key restricted free agents to re-sign. Here is a breakdown of Chicago’s free agent situation. 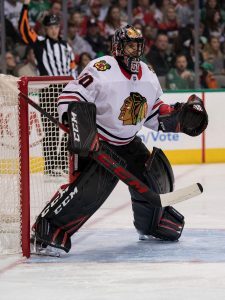 Top Restricted Free Agent: F Vinnie Hinostroza — For the second year in a row, Hinostroza got some quality time with the Blackhawks, totallying 99 games in those two seasons. However this year, the 24-year-old forward really showed that he can contribute at a high level. In 50 games this year, Hinostroza found himself working between the second and third lines, totaling seven goals and 25 points, while logging more than 13 minutes of ice time per game. As Chicago becomes more and more reliant on youth to fill in the gap for some of their aging veterans, the team needs Hinostroza to take that next step as a bonafide top-six center. 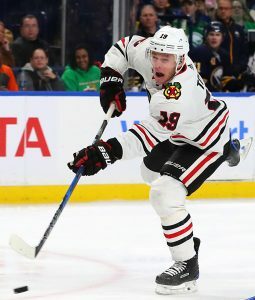 Having made just $925K this past year, he still is likely to have quite a low salary for a few more years, which is exactly the kind of value the ’Hawks need to rebound and compete for a playoff spot next year. Other RFA’s: D Adam Clendening, F Anthony Duclair, F John Hayden, F Tomas Jurco. Top Unrestricted Free Agent: D Cody Franson — Perhaps a better word is ’none.’ There are no key unrestricted free agents unless you look real deep on their roster. You would have to look at players who the team moved to Rockford near the trade deadline when the team decided to give their young players as much playing time as possible. Franson was one of those players, who possesses the offensive talents, but lacks the defense to compete at an NHL level and has bounced around the league looking for a permanent home. 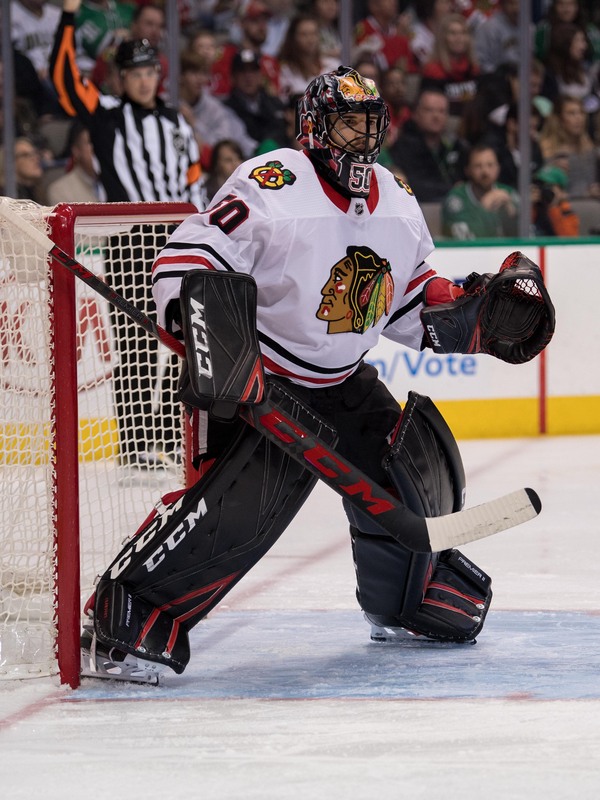 Don’t count on Chicago being that place as a recent report suggests he’s not expecting to return next season. He tallied just a goal and six assists in 23 games, but was put on waivers in January. Other UFA’s: F Lance Bouma, F Christopher Didomenico, G Jeff Glass, F Andreas Martinsen, D Michal Rozsival, D Viktor Svedberg, F Jordin Tootoo. Projected Cap Space: The salary cap has not been Chicago’s friend over the past few years with big contracts the team handed out to Patrick Kane, Jonathan Toews, Duncan Keith and Brent Seabrook, among others. However, the team has done a good job of moving some contracts and have $6.1MM of cap space available to them, and that’s not including the assumption the cap could go up $5MM next season. The team might have the ability to bring in a free agent or two to help aid the veterans in making a playoff comeback this year. While it’s not likely to include a high-priced free agent, their available cap space should be an asset for the coming season. While the Bruins convinced Ryan Donato to leave Harvard and turn pro on the weekend, the Flames will not be able to do the same with defenseman Adam Fox. Postmedia’s Wes Gilbertson reports (Twitter link) that the 20-year-old defender will remain at the NCAA level for his junior campaign, saying that “For right now, just staying and focusing on school and hockey, that’s my focus”. Fox was Calgary’s third-round pick (66th overall) back in the 2016 draft and posted 28 points (6-22-28) in 29 games this season. After playing through a shoulder injury for a while now, the Oilers have shut down defenseman Oscar Klefbom for the rest of the season and announced (Twitter link) that he has undergone successful surgery. He will be cleared to resume workouts in the next five to six weeks. This caps what has been a particularly rough season for the 24-year-old as Klefbom recorded just five goals and 21 points in 66 games, well below his output of a dozen tallies and 38 points in 2016-17. The Blackhawks will be without center Jonathan Toews for the next few games due to an upper-body injury, head coach Joel Quenneville told reporters, including Mark Lazerus of the Chicago Sun-Times. The injury was sustained on Tuesday against Colorado although the captain was on the ice late in the contest. He will be re-evaluated next week. If the Stars are going to work their way back into the playoff picture, they will have to do so without the services of center Jason Spezza. Mark Stepneski of Stars Inside Edge notes (Twitter link) that the veteran is dealing with a back injury and will be re-evaluated in two weeks, effectively all but ending his regular season. They could get some good news from the infirmary, however. Stepneski adds that blueliner Marc Methot participated in a full practice today and could get the green light to return for Friday’s game against Boston after missing more than a week due to a hand laceration.